Send your best wishes along with this delicious wine basket including Columbia Crest's Cabernet Wine, Tillamook Country Smoker Beef Summer Sausage, Tillamook Cheese, Partner’s Crackers, Macy's Cheese Sticks, Seattle Pretzels, A.J. 's Walla Walla Onion Mustard, Seattle Chocolate Truffles and Seattle's Own Shortbread. 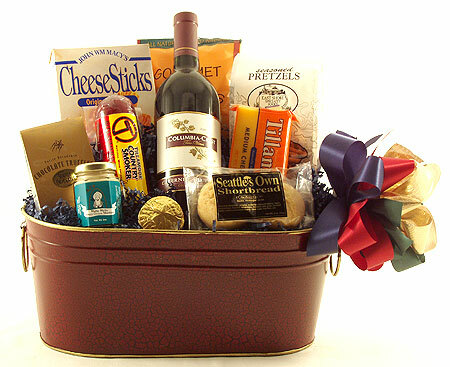 A great combination of gourmet foods and wine, easy to send and a real treat to receive! Available with wine, champagne or sparkling cider.